if you like apple's ios interface but have a pile o' poo emoji for its navigation system, you're not alone. a new study finds apple carplay beats android auto in user satisfaction despite apple maps, a system preferred by fewer than 1 in 4 smartphone navigation users. users report "significantly" higher satisfaction with carplay than its android counterpart, j.d. power and associates' 2018 u.s. tech experience index study found. apple's in-dash smartphone interface garnered 777 points on a 1,000-point user satisfaction scale; android auto turned up only 748 points. that's despite widespread apathy for apple maps, a system carplay forces you to use. among drivers who use smartphone navigation, just 23 percent prefer apple's system; 16 percent prefer google-owned waze, while 56 percent prefer google maps. the scale tips so far in google's direction that even iphone users prefer a google navigation system, while "very few android owners use apple maps," the study said. "google maps is outperforming apple maps in terms of ease of use and accuracy," said kristin kolodge, j.d. power's executive director of driver interaction and human-machine interface research. some iphone-toting drivers with carplay even forsake the integration to use google maps or waze off their phones, kolodge acknowledged. that may change soon. 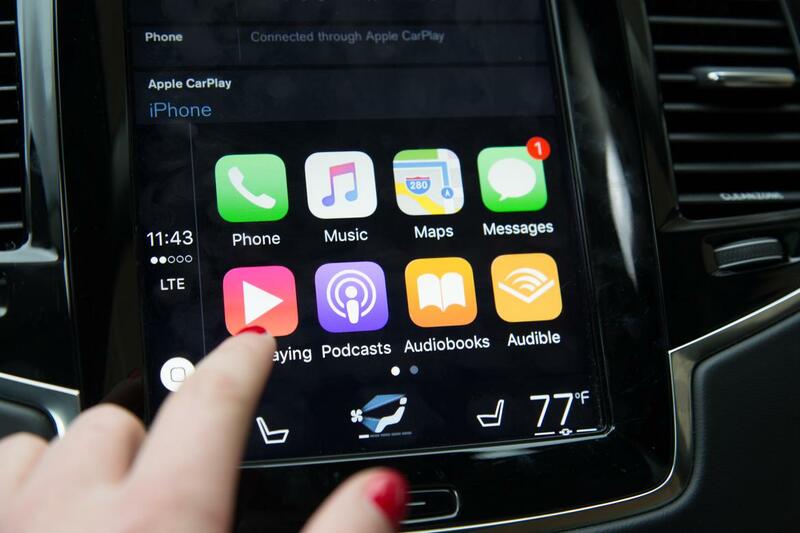 apple quietly announced in june that its ios 12 operating system, set to arrive this fall, will allow third-party navigation systems to work with carplay — something the system hadn't previously allowed in the more than four years since it debuted. android auto and apple carplay have fast become "must-haves" for consumers, the study emphasized. unsurprisingly, 16 of the 17 vehicles for the 2018 model year that j.d. power named winners or runners up for tech usability offer both systems. just one, the 2018 land rover range rover velar, does not. it might be time for automakers to taper investments in onboard navigation systems. nineteen percent of new-vehicle owners with factory navigation don't even use it, j.d. power found. of that group, nearly seven in 10 use smartphone navigation apps instead amid widespread belief that the latter systems are more accurate. purveyors of console-based multimedia controllers like audi and bmw have added touchscreens to their latest cars, and mercedes-benz will soon follow suit. brands like alfa romeo and lexus have gone the other way, relying mostly on console-mounted knobs or finger pads to control screens you can't touch. acura is heading that direction, too. if the j.d. power study is any indication, that's the wrong move. touchscreens drive higher user satisfaction than console controllers. in fact, 16 of the 17 vehicles called out for tech excellence have them. only one — the audi a4 — does not. "touchscreens are preferred significantly over the knob-based controls, and this is for premium and non-premium cars," kolodge said. "consumers are very happy with the touchscreen interface, and when we ask which technology they would want again in the future, touchscreens win out. they top the list over the console controller every time." no particular style of console controller has evened the disparity. kolodge confirmed that owners prefer touchscreens over any type of console system: knob, touchpad or otherwise. "this interaction conversation between a touchscreen and a console-based controller — a lot of that has been formulated from a design distinction," she said. but "really, when you think about navigating through menus, it's more complex and in many cases takes longer to complete with that console controller." part of the ratings for the study involve scores for safety and self-driving technology. the study found consumers increasingly appreciate blind spot warning systems — something that echoes what hyundai told us last year — but aren't as keen on lane departure warning systems. whether the latter systems apply steering intervention or not, they tally the highest rate of user annoyance among such driving technologies j.d. power surveyed. and they're out front by a mile. kolodge said the rate of user annoyance from lane departure warning systems is nearly three times higher than the rate of annoyance from the next highest system, forward collision warning. it's no surprise that a 2017 study from the insurance institute for highway safety found many drivers turn such systems off even though they can reduce the risk for certain crashes by 11 percent. the tech experience index study, now in its third year, measures satisfaction among new-car owners across 38 driver-oriented vehicle technologies in the first 90 days ownership. of note, luxury cars don't necessarily enjoy higher technology satisfaction scores: overall satisfaction with new-car tech among luxury vehicles ranked 766 out of 1,000 points, j.d. power found. among non-luxury cars, tech satisfaction averaged 765 points. what about tesla, the purveyor of giant touchscreens and advanced driving tech? as we learned in other j.d. power studies, the california automaker's results remain stuck in limbo. fourteen states, including car-heavy california, require automakers to grant permission for third parties to survey owners, kolodge said, and tesla is the only automaker that refuses it. j.d. power still lacks enough samples from owners in the remaining 36 states, but the numbers are "certainly increasing year-over-year," kolodge said, and the firm is "getting closer" to a large enough sample size to include results. asked about the permissions, a tesla spokesperson did not immediately clarify the automaker's interactions with j.d. power to .